I set and achieved a number of fitness goals this year. I managed to gain enough strength to do a few push ups from my toes! I have never been able to do that before. I set out to work out on a regular basis, which I did for a while, but I need to get back to it, because I feel like I am getting a little flabby and am losing my strength and endurance. I also trained and ran two races this past summer. A goal I am thinking of working toward is running a half marathon next year. I think it is possible, but if I don't run this winter, I am going to have to start back from square one next spring. If not a half marathon, I would like to at least run another 5 or 10k or two, just to keep my cardiovascular health up. Another goal I have had is to learn how to make bread and buns. I think I am okay at making bread, but I still need some practice in making buns look pretty. So far my buns have either come out burned or lumpy. Yesterday after attempting (and failing) to make rolled and cut cookies I set another goal of learning how to make rolled and cut cookies. I am not totally sure what the texture of the dough should look like, and how much flour you might need so they don't stick to everything. So, I would like someone to get together with me and make some rolled cookies....gingerbread, sugar, etc. so I can gain confidence in knowing how to do it. This picture makes me smile. 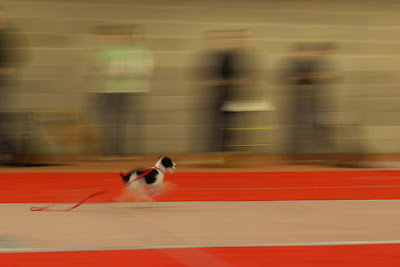 It was at Kiwi's puppy obedience class that we took when she was 4-5 months old. This was during an exercise where the teacher would hold the leash and I would walk away a certain distance then turn around and call her to come. She was SO fast! I always liked this picture because her legs are just a blur. She has always been anxious to be with us when she is in an unfamiliar situation, so she did very well in this exercise.